The Fujita scale is used to measure tornado intensity. A Fujita scale measures tornadoes. The Fujita Scale is a scale that climate and weather scientists use to measure the intensity of a tornado. Tetsuya Fujita from the University of Chicago introduced the scale with his colleague Allan Pearson in 1971. This scale would be used to rate tornadoes that had happened in the past and this scale is still used today, although it was updated in 2007. Scientists will now use the Enhanced Fujita Scale, based upon the original. Criticism of the Fujita Scale comes from the fact it is biased towards construction standards of the United States of America and the fact that damage is the main measurement of the scale; rather than using something objectively measurable such as the speed of the wind within the tornado. The 1996 film Twister has frequent mention of the Fujita scale. F5 tornadoes are an extremely rare occurrence. These tornadoes have an estimated wind speed of up to 318 miles per hour! With this wind speed, incredible damage would occur. Strong, modern housing would be ripped off their foundations and carried until destroyed, cars would be lifted and thrown in the air as if they were nothing, and even steel reinforced concrete structures, such as banks and town halls would be badly damaged, some beyond repair. In the history of scientific tornado data, less than 0.1% of tornadoes can be classified as F5. F4 tornadoes amount to 1.1% of total world-wide tornadoes. The 260 mile per hour winds these storms can generate cause devastating damage. These tornadoes are quite rare, and many that occur do not even touch land that humans inhabit. Houses will be leveled and some larger buildings will also be destroyed by projectiles such as small cars, trees, and flying rooftops from houses! The F3 tornado can produce winds of up to 206 miles per hour, which cause severe damage. 4.9% of all recorded tornadoes are rated as F3. Houses will have their roofs and even walls ripped off (some housing will be completely destroyed), heavy cars and even buses can be lifted off the ground and violently thrown, most of the trees in the area will be uprooted and destroyed, and even freight trains can be overturned and heavily damaged by these winds. F2 tornadoes wind speed can be up to 157 miles per hour and these tornadoes compose 19.4% of all tornadoes world-wide. F2 tornadoes will have significant damage wherever they occur. Roofs will be torn from houses, cars can become overturned, trees will be snapped and/or uprooted causing damage, large buildings will have their windows blown in, as well as many smaller objects such as park benches and tables becoming dangerous missiles! 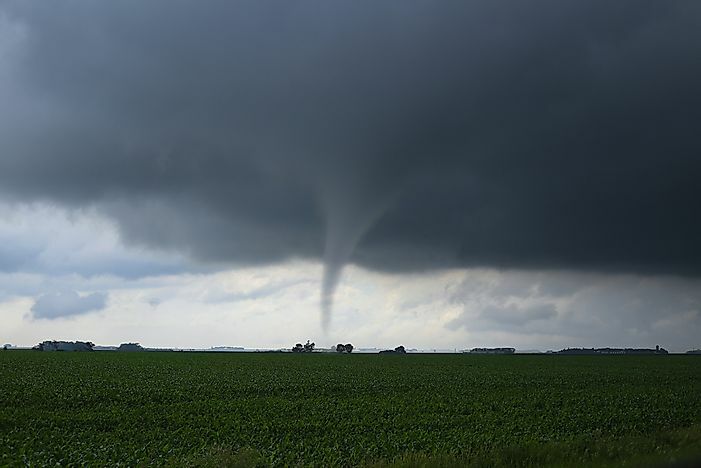 F1 tornadoes make up 35.6% of total tornadoes and generate winds of up to 112 miles per hour. This speed of wind will create moderate damage and structures that are not as solid as housing, such as an outdoor garage or mobile home can be destroyed, as well as large tree branches snapping off and causing damage. Tornado Alley in the United States of America also has many F1 tornadoes every year. The most frequent tornadoes are those rated F0. These tornadoes account for 38.9% of all recorded tornadoes in the world. The wind speed can reach up to 70 miles per hour and will cause light damage to property and flora. Many of these will occur throughout the United States each and every year especially in a place named "Tornado Alley" in the South-Eastern part of the country.